It was Fall of 1835. Mexican President Santa Anna had dissolved the Constitution and made himself dictator. Tensions began to flare between his oppressive government and the liberty minded desires of Texians and Tejanos. To suppress the rumblings of unrest and revolution, the Mexican military leaders began their quest to quietly disarm the Texians. One of the first actions was to retrieve a cannon lent to the Texian colonists at Gonzales. The famous bronze cannon was loaned to the Gonzales colonists by the Mexican government in 1831 to defend themselves from hostile Apaches and Comanches. Mexican Corporal Casimiro De León and a few soldiers were send to reclaim the cannon. That task was easier said than done. The feisty Texians said they were keeping the gun and took the soldiers prisoner. The ladies of settlement even made a flag bearing the words “Come and Take It!” to be flown over the cannon. The cannon had been buried in a peach orchard near the Colorado River for safety, but was retrieved shortly after and readied for battle and mounted on cart wheels. The Mexican government responded by sending Lieutenant Francisco de Castaneda of the Mexican Army and 150 troops to put an end to the dispute. 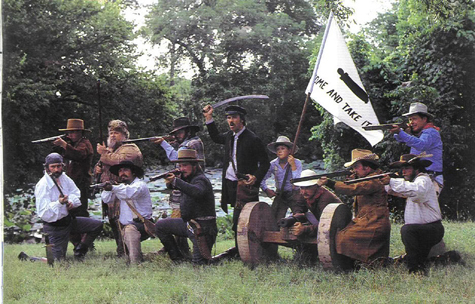 They were met by a militia of frontier Texians and Indian fighters who simply said, "There it is – come and take it." After a few shots were fired by both sides the Mexican army left the engagement. The Battle of Gonzales went on to be known as the “Lexington of Texas”. It was Act I of the Texas War of Independence. It was similar to Lexington because sixty years earlier the British had tried to seize the weapons of the colonists at Lexington and Concord. The Texas War, like the American War of Independence, began because oppressive government tried and failed to disarm the people. The citizens of Texas would not surrender their arms to appease the overbearing Mexican regime. History has an odd way of repeating itself. Flash forward 200 years. One night I was at a town hall meeting in Spring when a local preacher came up to me to share his concerns about where our country was headed. It is always refreshing for me to hear from normal people in Southeast Texas after spending all week long in the land of the bureaucrats. I will always remember this particular neighbor because of his strong opinions and his shirt. It had a photograph of the Bible and two .45 Colt revolvers with the words "I love my Bible" and “I love my guns”. Naturally, they were in the right order. God then guns. Leave it to a Texas preacher to keep it all in perspective. You wouldn't see that shirt up in Washington, D.C. Some elites outside of our Great State fear "us southerners" and our colt 45s, and ridicule those who cling to their guns and religion. In Texas we have a rich tradition of proudly celebrating the right to bear arms. The elites seem to forget that not only do we cling to guns and religion, we cling to the Constitution that protects these rights. Many Texans believe the call for gun control is really a call for more government control. Texans aren’t the only ones who have historically defended this right. During the birth of our nation, the Founding Fathers were very concerned--almost paranoid---that a strong Federal Government would trample on the rights of the people. Their concerns were warranted because that is exactly what happened to the colonists, and that's what governments historically do---trample on individual liberty. So after the ratification of the Constitution, the Framers purposely included a list of inalienable rights that are endowed by our Creator, not from government. One of them being the individuals' right to bear arms. They knew from their experiences in the American War of Independence that an armed citizenry and a citizen militia were not only needed for personal defense, but were also the best safeguard against the tyranny of government. But here we go again. Today some in government once again fear the freedom of its citizens and are now called to round up all the guns. Ironically, each day in the U.S. Capitol there are guards with guns by the doors--to the north, to the south, to the east, to the west--on the roof, on all of the entrances, and by the steps. Many elitist politicians and lifelong bureaucrats expect protections for themselves while advocating for more restrictions on guns for the people of America--hypocrisy at its highest. Most citizens don't have government guards protecting them 24/7. Many people feel defenseless. In fact, one of the proposals for more gun laws mirrors the stringent D.C. gun laws. If the D.C. gun laws worked, D.C. would not be such a violent city. If D.C. gun laws worked, why are there so many armed guards at the Capitol? The elites want more government power and control while taking away liberty from the rest of us. They want to punish the guns, not the people who commit crimes with guns. They want to keep their special government protection while redlining the Second Amendment for the people. They say, "Protection for me but not for thee". Not much has changed since the days of the Santa Anna. Oppressive governments will always seek to limit the freedom of their citizens. Mexico eventually lost Texas and Great Britain eventually lost America. Both wars started because those in charge wanted to take guns away from the citizens. Those who seek to take guns away from Texans should open a history book. 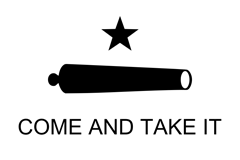 Those early Texans defied Santa Anna, hoisted the flag "Come and Take It", and the rest they say is Texas history. Make sure to check out the comments on Faceook.